Andrew Hartig holds two Bachelor of Art (BA) degrees from the University of California at Santa Barbara: one in Renaissance Studies and one from the College of Creative Studies, with an emphasis in Literature. During that time he focused his studies on works predating 1700, including the works of Dante, Chaucer, and Shakespeare, and he studied the phenomenon of Elizabethan and Stuart masques. In addition, he holds a Masters of Education (M.Ed.) degree in Secondary Education, also from UC Santa Barbara. Mr. Hartig currently teaches high school English full-time in the San Francisco Bay Area. When not busy grading papers or spending time with his wife and children, he can be found performing music, transcribing and editing early music manuscripts, building instruments, and researching and writing articles. He started playing early music in 1993 and currently performs with the Bay Area early music ensemble Theatrum Musicum, of which he is also a founding member. He has also played in small jazz ensembles on both electric and upright bass. He has worked with Lyre Music Publications as an assistant editor and is currently working on an edition of music for the Renaissance cittern. In early 2006, he took up luthiery and began building his own instruments on which he performs. With the remainder of his "spare" time, he researches and writes articles on early music and performance, and in the fall of 2009 he began "The Wire Connection," a new column published regularly in the Lute Society of America Quarterly. 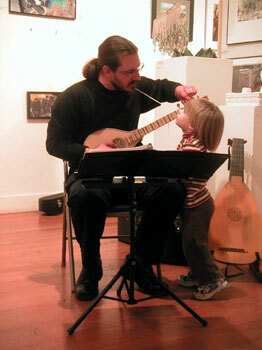 In addition to being the sole editor of the Renaissance Cittern Site, Mr. Hartig is assistant moderator of the cittern group at http://www.cittern.ning.com and has done work creating, editing, or maintaining several other web pages, including the Bay Area Lute Pages (a local chapter of the Lute Society of America).